Recently there has been a concerning trend targeting our neighborhoods. During the overnight hours, suspects are canvassing residential neighborhoods targeting parked cars and our homes. The typical MO of "door checking" has been taking place where suspects will check the door handle of vehicles parked in the street, driveway or accessible carport to determine if the vehicle is unlocked. If unlocked, the suspects will enter the vehicle and ransack the interior and pop the trunk looking for any valuables. In addition, in vehicles that are started with a Fob Key, the suspects will depress the Start Engine button to see if the engine will start. This has been successful in cases where Fob Keys were either left inside or hidden inside the vehicle resulting in the car being stolen. Recently, while door checking cars, suspects have also been "door checking"the doors to homes as well. In recent incidents the suspects have entered unlocked doors targeting purses, wallets, brief cases, keys, and small electronics that are typically left within close proximity to the door. Additionally, in incidents where the doors were locked but there was window glass as part of or adjacent to the doors with valuables visible inside, the suspects have smashed the window glass conducting a "smash and grab" of the same property left within reach just inside the door, all while residents are sleeping inside the home. Daytime and Evening Trends continue: The "Knock Knock Burglary" series continues. The suspects typically knock or ring the doorbell to determine if anyone is home. When there is no answer, the suspects enter the side or rear of the residence and force entry typically by smashing the window or door glass to gain entry. Suspects are targeting the master bed and bath as well as other areas of the home and removing jewelry, cash, small valuables and small electronics. Immediate Detection! Is key to prevention and apprehension. • SURVEILLANCE/SECURITY CAMERAS: Web based surveillance and doorbell camera systems will alert and allow homeowners to immediately view and monitor activity from any smartphone or computer which are motion sensor activated and will alert your device when there is activity.They will also lend valuable information and clues to the investigation. • ALARMS: Ensure that security alarms are in good working order and set when not at home whether leaving for 10 minutes or 10 hours. Accessible upstairs doors & windows should have alarm sensors and upstairs rooms should have motion sensors to include the master bedroom. • ALARM RESPONSE: Consider a private patrol alarm response to enhance your current alarm and security system. In many cases private patrols are already contracted in many neighborhoods or associations. • MOTION SENSOR LIGHTING: Install motion sensor lighting around your home to illuminate normally dark areas around the home. This will also alert residents to outside activity around the home when motion lights are activated. • GATES: Ensure that all gates and access points to the side or rear of the residence are locked and secured. • DOOR AND WINDOW LOCKS: Ensure that all doors and windows are locked and secured with sturdy secured locks and that there are second locking mechanisms securing all doors and windows as a second line of defense. • MAKE IT LOOK LIKE YOU'RE HOME…Even when you're not. • NEIGHBORHOOD WATCH: Monitor suspicious activities in your neighborhood and alert your neighbors. Should the activity escalate to a crime about to occur, crime in progress or crime that just occurred, CALL 911 IMMEDIATELY! • SECURITY PATROLS: Consider after hours on site security at construction sites or major remodel projects. Many neighborhoods contract with private security patrols which monitor neighborhoods and can quickly respond to burglar alarm activations or reports of suspicious activity when they occur. LOCK IT • HIDE IT • KEEP IT! 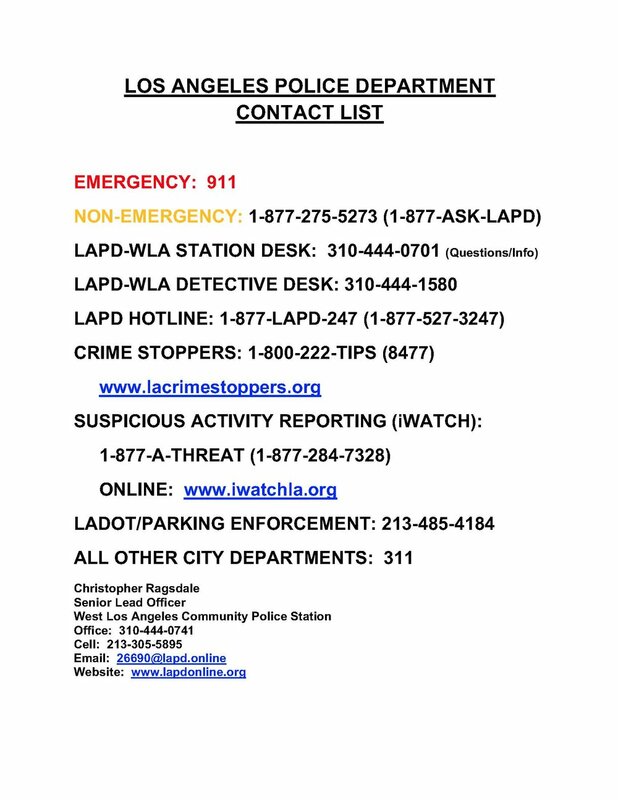 Click here to link to PDF file of LAPD Contact List.